Over the next weeks, I’ll be posting seven short podcasts that introduce my take on some of the main issues that trouble copyeditors. In twenty years of reading emails from writers and editors for The Chicago Manual of Style’s online Q&A, in addition to my own work as an editor, I’ve learned a thing or two about what’s bothering us! In podcast 1, I name what I see as the top two causes of grief for copyeditors and what we might do about them. There are also transcripts for those who would rather read than listen or who can’t stand the sound of my voice (I know how that goes). 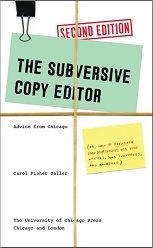 The podcasts were adapted from material I first presented in the Copyediting audio conference “The Subversive Copy Editor Takes Your Questions,” December 10, 2009 (© 2009, Copyediting), with the kind permission of the publishers; and from my own book, The Subversive Copy Editor, 2nd ed. (Chicago: University of Chicago Press, 2016). And if you’re bothered by the copyeditor vs. copy editor issue, you can read about it here. "Do you follow grammar 'rules' you don't understand?"